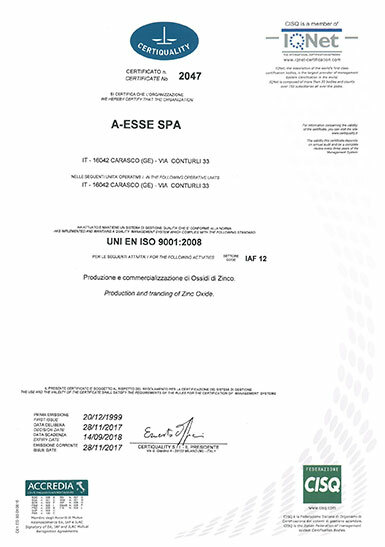 A-ESSE considers quality a key goal for guaranteeing the properties of its products and ensuring customer satisfaction. 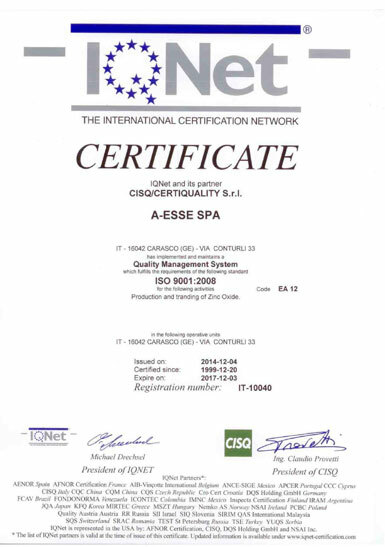 In December 1999 A-ESSE s.p.a. obtained Quality Management System certification under standard UNI EN ISO 9002. This acknowledgement was obtained upon completion of a technological and organisational revamping process begun in the second half of the nineties with the goal of achieving on-going improvement. In December 2002, when the company’s certification was up for renewal, it completed transition from standard UNI EN ISO 9002 to UNI EN ISO 9001:2000 (Vision 2000), followed, in December 2008, by transition to standard UNI EN ISO 9001:2008. Certification has been kept up to date ever since.